Frankfurt's Musikmesse is Europe's largest music equipment trade fair, and the 2010 event runs from 24-27 March. As you'd expect, MusicRadar will be reporting live from the show floor, bringing you the latest news, plus photo galleries and videos of the hottest gear and most eye-catching stands. We'll be sure to stalk any celebrities who are walking the Musikmesse halls (and riding its numerous travelators), too. 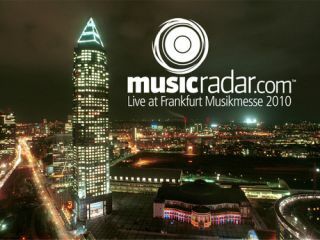 If you want to browse all of MusicRadar's Musikmesse 2010 coverage in one place, why not sign up for our newsletter (sent every day direct from Frankfurt) or just bookmark this page. We'll keep it updated 24/7, so you won't miss a thing. The Fret-King Country Squire BT "Evocation"
DA FACT unveils Karlax, "the ultimate controller"